When it was announced in the summer that Cristiano Ronaldo was coming to Turin, the fans were excited to see one of the best player in the world move to Juventus. It also meant that Juventus would be playing a more attacking and expansive brand of football, with Ronaldo joining Dybala in being a luxury player who hates tracking back. Cristiano Ronaldo took some time to get used to the pace and tactics of Serie A, but once he got used to it, he started banging in the goals. He is currently leading the race for the Serie A golden boot, something that was not expected out of him, given that he was brought in to win the elusive Champions League trophy. What is encouraging is his inspiring link-up play and chemistry with Mario Mandzukic. The Croatian is enjoying his best season in front of goal, thanks to his chemistry with Cristiano. While Paulo Dybala has not been as productive in front of goal as previous seasons, he has been a consistent fixture in the team, stitching the play up brilliantly in the attacking third and scoring some very crucial Champions League goals. In the end, any trio with Cristiano Ronaldo in it is bound to score a lot fo goals, even if the team as a collective does not play an attractive and attacking brand of football. Lucian Favre has brought back some magic at Borussia Dortmund. The Swiss tactician has been instrumental in the return to form and fitness of Marco Reus. He has also ensured that one of their key players, Christian Pulisic, who had finalized a move to Chelsea in the summer, is phased out while young English winger Jadon Sancho is integrated into the team. The biggest surprise package, nobody would have expected much from, was Paco Alcacer. Jadon Sancho was an assist machine for the first few months, setting up Marco Reus and Paco Alcacer match after match. The 18 year old then started showing his finishing ability and has scored 7 Bundesliga goals so far. But the star of the team has undoubtedly been the fully fit and bang in form captain, Marco Reus. The German ace has scored 17 goals along with his 7 assists, ranking second on the Bundesliga goalscoring charts. 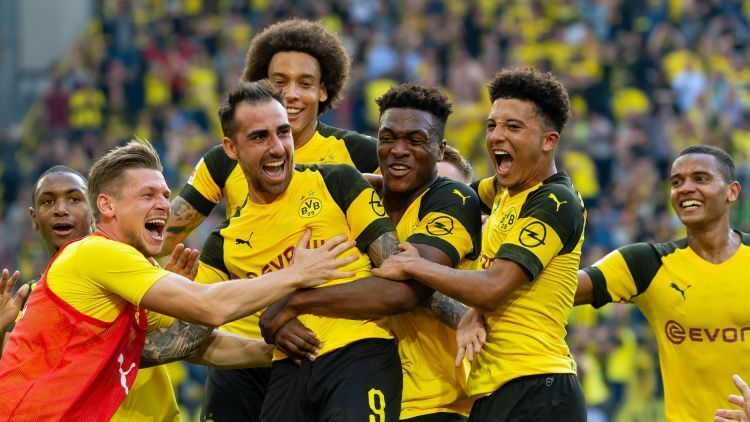 The form of the front three has seen Dortmund outscore almost every opponent and sitting comfortably at the top of the Bundesliga table, 7 points ahead of Bayern Munich and Borussia Monchengladbach. Reus, Alcacer and Sancho are all so different in their style of play, yet when they come together on the football pitch, they create some magic every time.